If you love the clean, fresh and and timeless look of Scandinavian design Stitched in Scandinavia by Karin Holmberg is definitely worth checking out. A more appropriate title for the book would have probably been 'Stitched in Sweden'. The techniques described in the book and the inspiration for the motifs in the book really all originate in Sweden. Obviously similar techniques and motifs would have been found in other parts of Scandinavia but the other Scandinavian countries definitely also have their own needlecraft 'specialities' and motifs. Karin's designs give a contemporary twist to traditional Swedish needlecraft techniques such as På or Järvsö embroidery. If you haven't heard of these techniques before (I had not) don't worry! A lot of the stitches used will be familiar to you if you have a good basic knowledge of embroidery. There is an overview of what materials and stitches are used with the different techniques. In some cases local Swedish, materials are used but internationally available alternatives are listed too. There are 39 projects in the book. Some of these have short instructions on how to sew the item you'll be stitching on (like a cushion cover) and others use store-bought textiles like underwear or a hoodie. The instructions for the embroidery part of the projects are generally not detailed. To me personally that isn't a problem, especially as I'm not very good at following other peoples instructions anyway. The sweet nursery embroidery with two plumb birds for example is worked in Blekinge embroidery but which type of stitch (surface satin, French Knot etc) goes where is something you have to work out yourself. Again with a little embroidery experience under your belt this shouldn't be too much of a problem. All embroidery patterns can be found in the back of the book alongside information on embroidery stitches, transferring the designs and fabric care. The book and the projects are mostly meant to inspire and there surely is a lot of inspiration to be found in these pages. I'm smitten with these colourful Scanian Woollen embroidery designs...and the photography throughout the book is just lovely. The many project ideas and patterns in this book are a wonderful source of inspiration if you are looking to add a unique Scandinavian (or rather Swedish) touch to your home decor and clothing. I'm always keen to learn about traditional embroidery techniques and I admire how Karin Holmberg uses these in a modern (and practical!) way. 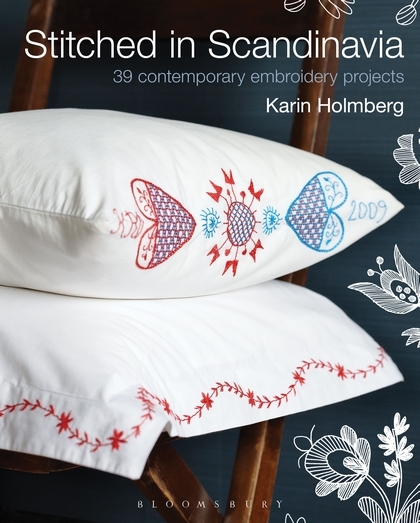 Stitched in Scandinavia by Karin Holmberg is published by Bloomsbury and available from May 23rd. This book was sent to me by the publisher for review. This review is my own opinion about the book. I keep thinking I *need* to explore this Swedish style embroidery. This book may finally be the one to push me to it. Amazon recently recommended this book to me. The photos look amazingly inspiring. Thanks for the review! I think I might have to pre-order it!